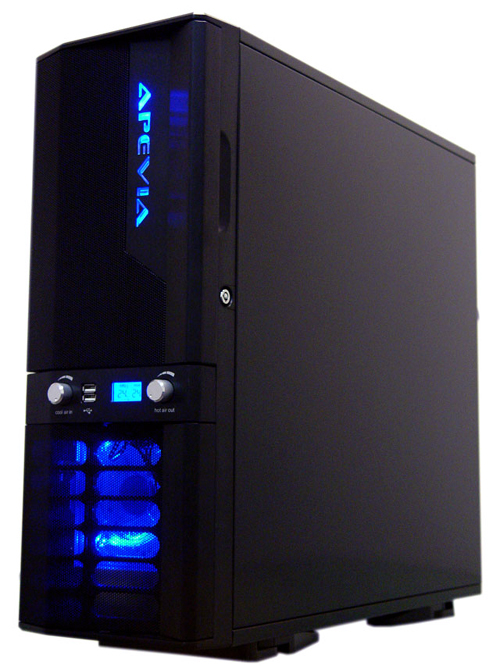 The X-Jupiter G Type is a full tower, which is ginormous enough to accommodate almost anything you want to throw inside. This case also has an extended body to fit a full size motherboard (12"x 13") and a toolbox tugged into the internal drive space to store your tools and screws. Stocked with 4 x 120mm fans keep this spacey aluminum case even cooler. Comes with two fan controllers, one to control air in and the other to control air out (you can adjust the fan speed and noise level). There are four USB access ports (2 on the front and 2 on top) for your USB devices. Most of all, the front temperature LCD shows the temperatures of where the two temperature sensors go, that way you can be aware of your systems cooling condition avoid any issues.